So, my sister got me these great cassette tape glasses as a gift, and they came with a grease pencil to write the name of the mix. This morning, I wrote down the name of one of my mix tapes from when I was a young lad and it occurred to me that I have enough mixes to make it an occasional feature here on the ol’ blog. The name “juicy tapes” derives from the liquid in the glass. So here it is. I went to visit my cousins a couple of times in the mid-80’s down in Long Beach, MS. They had a funny way with naming things – they called a local bar “church,” as in “let’s go to church after this”. 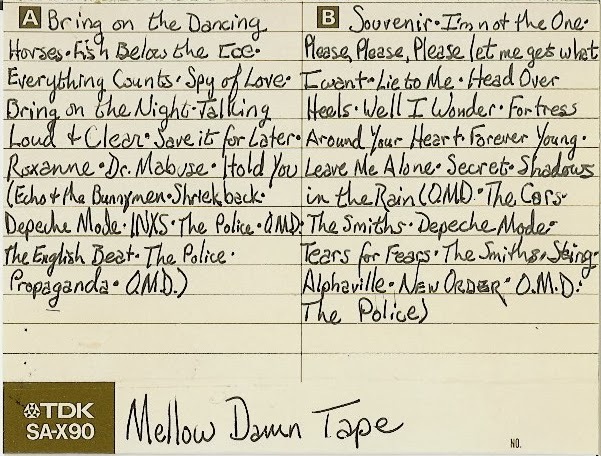 And I’m pretty sure someone had a mixtape named “Mellow Damn Tape”. I loved it, and I lived in Colorado (far away from Mississippi), so I ripped the name off for one of my own mixes. The mix as it stands isn’t all that mellow – I could have (and have, I think) done much better. But it’s certainly a snapshot in time, somewhere in 1985, I’d guess. Original J-card below. LOVE. Listened on perpetual repeat all morning. Thanks, Josh! Glad you liked it. 🙂 It's definitely of a period – many of my mixtapes are like that, I think, probably because I was putting on new music that I was excited about. Even mixes that include older songs, I can still tell probably to the year when I made them. I don't think I made any "old time" mixes with only older songs. TDK tapes. Nice. My brand of choice, back in the day. TDK's for sure. Sometimes I would have another brand lying around, but if I was buying, it was TDK.